Aspire has achieved since it was founded in 1983. To find out more about the many ways in which Aspire supports spinal cord injured people through our Services, including housing, assistive technology, welfare benefits and independent living, please go to aspire.org.uk/our-services. We are looking forward to an amazing year of fundraising. If you, or your family and friends, would like to fundraise for Aspire please go to our website to find out the many opportunities available, from running and swimming to holding a bake sale or attending one of our Sports Quiz Dinners. Find out more at aspire.org.uk/fundraising. 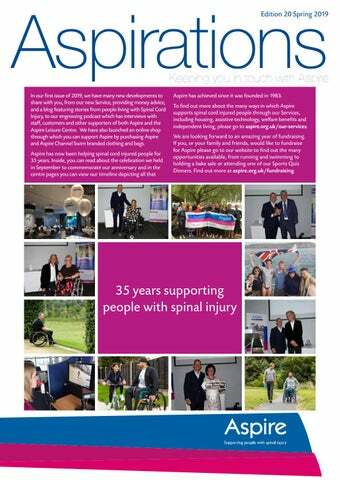 Aspire celebrates 35 years of supporting people with Spinal Cord Injury Aspire has now been supporting people with spinal cord injuries for 35 years. A celebratory evening was held in September to mark the occasion and to say thank you to staff, supporters and the original founders of the charity. Awards were presented to particularly influential supporters including founding trustees, Candoco founder Celeste Dandeker, Aspire’s President John Inverdale, Sports Quiz Dinner question-setter Rob Nothman and former Chair Peter Stanford. at Aspire during her rehabilitation following elective amputation. Fundraising and Marketing, tells us about his journey from an unhealthy lifestyle to taking on a variety of challenging endurance events. If you would like to submit your story please email laura.haynes@aspire.org.uk. Mark was injured in a motorcycle accident when he was 27. He says, “I do remember thinking that I wouldn’t be able to cope... but I was wrong.” Mark contacted Aspire’s Welfare Benefits team because he needed help with the transition from Disability Living Allowance (DLA) to Personal Independence Payment (PIP). He says, “The team were extremely helpful and their assistance was invaluable all the way through. To be honest, I didn’t have a clue what I was doing as the PIP form was overwhelming. With Aspire’s help, I was awarded PIP at the Enhanced Rate for both the Daily Living and Mobility components. either for yourself or someone you know with a spinal cord injury. Disability is expensive. A Your Fund enables your friends and family to help pay for the costs of essential equipment or services by starting to fundraise even before you know exactly what you will need, ensuring the funds are there to use when you need them most. Raising money through an Aspire Your Fund rather than other crowdfunding options can boost your total by up to 25%. A dedicated member of staff will work with you to help set up the fund and give you fundraising advice, to ensure you raise as much money as possible for Your Fund. the experts sent by Aspire Law, giving me and my family financial stability. “My experience with Aspire Law has been brilliant all the way through. When they say an expert’s going to contact you that’s exactly what happens. They don’t mind you ringing up every five minutes or sending an email. I’d recommend Aspire Law because they are experts in their field of spinal cord injury. They have your back covered and your family’s back covered throughout the whole case.” Aspire Law is the only UK law firm dealing exclusively with Spinal Cord Injury claims, providing specialist expertise and, for personal injury claims, does not deduct any fees from the client’s compensation. Aspire Law shares 50% of its profits with Aspire to support people with spinal cord injury, allowing it to help those with spinal injury who have no claim to make for compensation. For more information about Aspire Law go to www.aspirelaw.co.uk (other spinal injury claims specialists are available. We recommend thoroughly researching to meet your needs). New Money Advice service In January we launched a new Money Advice service which offers free, impartial and confidential telephone advice to people with Spinal Cord Injury who are concerned about their debts and day-to-day budgeting needs. The step-by-step Money Advice process is designed to help individuals take back control of their finances. Following a spinal cord injury, financial circumstances often change dramatically, with loss of earnings, increased spending on equipment and lifestyle adjustments often coming at the same time as someone is trying to navigate the benefits system. Our personalised service includes a full financial assessment, budget planning, filling out forms, negotiating with creditors and ongoing support. Richard Fraser, CEO, The Frenkel Topping Group, says, “We are delighted about the service that Aspire offers. When someone suffers a serious injury, the impact on that person and their family can be devastating, and coping with financial stress can be even more debilitating. The team at Aspire are very experienced in this area, and it’s important to have people around you that care and understand the issues during such a traumatic time.” Find out more at www.aspire.org.uk/money-advice or call 020 8420 8960 to speak with our Money Advisor. Many thanks to The Frenkel Topping Group for their support which has made this service possible. If you are concerned about your financial situation and are feeling stressed and unsure what steps to take, we can help you take back control of your finances. InstructAbility’s Wendy Hall: from spinal injury to fitness entrepreneur see a bit of the ‘old me’ returning, and gym members would speak to me like they did any other member of staff. Your support helps people like Peter to live independently. Every person who applies to Aspire Grants needs help purchasing much-needed equipment to enable them to get on with their lives. A gift, of any size, could help transform not only the lives of someone with a spinal cord injury, but also their friends and family, and give them the independence that most of us take for granted. Can you help us to provide spinally injured people with equipment that will give them back their independence? Please tick here if you would like to be kept informed of Aspire’s work via email and post. We will not pass on your details to any other organisation. Boost your donation by 25p of Gift Aid for every £1 you donate Tick here for Gift Aid. I want to Gift Aid my donation and any donations I make in the future or have made in the past 4 years to Aspire. I am a UK taxpayer and understand that if I pay less Income Tax and Capital Gains Tax than the amount of Gift Aid claimed on all my donations in that tax year, it is my responsibility to pay any difference. Please let us know if your tax circumstances or name and address details change so that we can amend our records.